This is the second of a 5-part series from guest-blogger, Dr. Dunstan Lowe, who teaches Classics at the University of Kent. “Always Already Ancient” was first published in print in the 2013 volume, Greek and Roman Games in the Computer Age. It is reproduced here by permission of the author and publisher. The classical museum becomes a ruin: Legendary (PC: 2008). 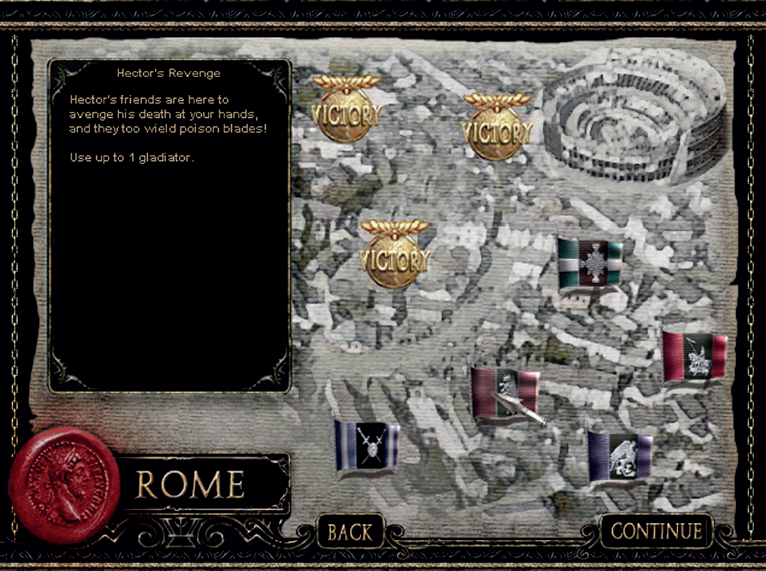 With their usual affinity for implausible scenarios, computer games have offered several strategies for representing antiquity in the heritage sector. In Medal of Honor: Airborne (2007) the ruins of Paestum, under the process of excavation, are opened up for an exploration that is invasive in every sense.2 The player is parachuted into the site to fight an enemy garrison, which involves exchanges of fire within the trenches of the dig itself. This provides atmospheric surroundings rather than professional insight, but it is not impossible for mass-produced games to enter a high level of archaeological detail. While not primary classical in focus, Barrow Hill (2006) goes even further by casting the problem-solving player in the role of an amateur archeologist, investigating a supernatural murder-mystery in rural Cornwall. It is an unusual exploration of a Stone Age site which involves using various tools of the trade, from the trowel to the GPS.3 Like certain other examples of the relatively easily made point-and-click game,4 Barrow Hill is a labor of love, but it did achieve mass distribution through chain-stores, demonstrating that the subject matter had widespread appeal. South America, China and (in particular) Egypt, classical Greece and Rome have featured more than once.5 In Tomb Raider Chronicles,6 Lara Croft visits Rome to explore Trajan’s Markets and the Colosseum in their modern, tourist-site incarnations. However, the Tomb Raider franchise places the emphasis on the touristic pleasure of varied scenery and not on the history of any given site, except insofar as it contributes to raising the stakes of the overall plot. The myth-inspired first-person shooter Legendary (PC, PlayStation 3, Xbox 360: 2008) casts the player in the role of mercenary master-thief Charles Deckard, who becomes involved in an apocalyptic invasion of monsters when he opens Pandora’s Box.7 Most of the action consists of running battles in a series of urban locations as they undergo destruction, including a cathedral, office blocks, and London’s Houses of Parliament. 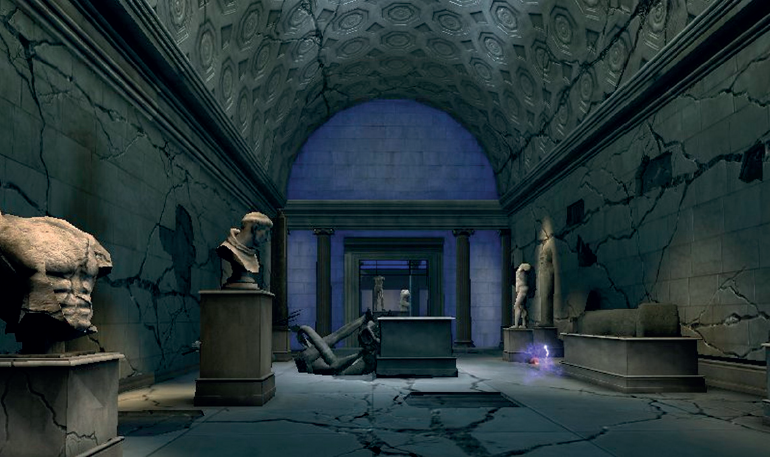 Since the Box was the prize exhibit in a major museum exhibition, however,8 the first segment of the game involves escaping from the classical wing of the museum while its artifact-filled rooms are themselves turned into fragmented ruins. Objects on display include various classical statues, most of them broken and missing limbs, as well as vases and Egyptian artifacts. More significantly, the architecture of the museum itself features colossal neoclassical columns, and when Deckard enters the main hallway above the Box, a pair of these breaks and collapses around him. Thanks to the power of an object from Greek myth, the museum’s classical gallery is transformed into a landscape of classical ruins, creating a fitting prelude for the more contemporary scenes of urban devastation waiting outside. Treating the modern world as a frame for the ancient, as in an archaeological site or a museum, is not the only way to create a double-layered interaction with the past. A second method frequently occurs, which relies on the distinct properties of the digital medium: games set in the past will often allude to relics of the past indirectly, through standard framing devices such as title screens and menus. These elements inevitably distance the player,9 but are usually designed to blend as much as possible into the fictive world of the game. When this world is the classical past, the very sight of ruins would theoretically interrupt the player’s immersion. In practice it does not, to judge by the colorful range of examples on offer. For example, the popular home console game Populous II: Trials of the Olympian Gods (1991) pits the player (an aspiring son of Zeus) against the other gods in a series of tactical games using mortals as pawns: clearly a mythic setting. Despite this, the image which acts as title card for the mortal world is the ruined Parthenon, certainly one of the most iconic images of ancient Greece that we have, but which does not exist in the notional “Age of Myth” in which the game itself is set – let alone in its ruined, twentieth-century state. The dead past as frame for the living: Gladiators of Rome (PC: 2002). hero is a centurion, revived from a pseudo-classical graveyard by a white-bearded god who wants his peplum-clad daughter to be rescued from the wizard “Neff”. Two-headed dogs play an important role in the action, perhaps alluding to Cerberus, and goat-man hybrids appear among the enemies, but here the Western classical allusions stop; by collecting “Spirit Balls” the centurion can transform into beasts including werewolf, dragon and tiger, and Neff finally takes the form of a rhinoceros in golden armor. Yet one of Altered Beast’s few tokens of Western classical culture, and perhaps the most insightful, is the image on the “attract mode” title screen: the characters of the game are portrayed as grey stone figures in a severely damaged relief carving, with large cracks and pieces broken off. This frames the “living” content of the game as taking place in a distant, legendary past with admirable clarity: the game provides no scene-setting text, and none is required. As we have seen, the framing of ruins in computer games in the Heritage mode can either mimic real-life phenomena (the “original framings” of tourism, archaeology, museums) or, inversely, use the imagery of time-ravaged remains to contain and supplement “real-life” reconstructions of the past which are in themselves immersive. In the latter scenario, ruins are not merely framed, but instead are the frame. In both cases there is the same apparent compulsion to juxtapose the preserved traces of antiquity with the revived original, as if they needed to validate one another. 2. Medal of Honor: Airborne (PC: 2007). 3. Barrow Hill (PC: 2006). 4. Another point-and-click game based on a historic site is the poorly received Anacapri: The Dream (PC: 2007), made with thousands of photographs of Capri. It includes archaeological remains among various other locations, but also uses the common plot device of time-travel in order to include the Emperor Tiberius (and even the sea-god Nereus) as speaking characters. 5. Many locations in the series evoke Greek and Roman antiquity. The plot of the original Tomb Raider (PC, PlayStation, Saturn: 1996) revolves around the revival of the civilization of Atlantis, and involves the discovery of “King Midas’ Palace” beneath a Greek monastery. In Tomb Raider: The Prophecy (GameBoy Advance: 2004) Lara explores a Roman villa on “Laconia Island”, where she fights skeleton warriors, and reads a Latin inscription. Hellenistic Egyptian locations in Tomb Raider: The Last Revelation (Dreamcast, Macintosh, PC, Playstation: 1999) include “Pharos”, “Temple of Isis”, “Temple of Poseidon” and “Cleopatra’s Palaces”. 6. Published concurrently on Dreamcast, Macintosh, PC and PlayStation in 2000. 7. As in God of War (PlayStation 2: 2005), the Box is an ornate metal chest resembling S. Spielberg’s Ark of the Covenant. The introductory montage portrays the classical myth of Pandora and her jar as a misinterpretation of the Box’s true nature. 8. The museum superficially resembles New York’s Metropolitan Museum; the exhibition is named “MYTHOS: Creatures of the Ancient World”, implying that the curators know more than the protagonist. 9. For a detailed discussion of one such element, the HUD or “heads-up display”, see Galloway (2006: 35-36). 10. The Victorian character of the game is reflected not only in its title, taken from the famous 1875 poem by W. E. Henley, but by the identity of the in-game advisor, a woman named Homah who claims to be “the center of knowledge” and promises to “sing the praises of your valiant deeds”. The idea that Homer was a woman also belongs to the late nineteenth century, thanks to S. Butler’s book (1897). 11. Altered Beast was published in arcades, then on the Amiga, Amstrad, Atari ST, Commodore 64, MSX, NES, PC, Sega Genesis and Sega Master System, and has recently been revived on the Wii Virtual Console and Xbox Live Arcade. 12. M. Roth (1997: 3).